TMD is contributing to the development of quantum technology in the UK with applications in atomic clocks, navigation systems and defence applications. TMD Technologies (TMD) been invited to exhibit at the forthcoming National Quantum Technologies Showcase in London on the 22nd November 2017. The invitation to attend this important event emphasises TMD’s innovative background and scientific expertise, and is a result of the company’s collaboration with academic and ultra hi-tech industry partners to realise the commercialisation of quantum 2.0 technologies. These technologies include small, portable, rugged atomic clocks, clock test and evaluation facilities; compact frequency-stabilised laser sources and miniature magneto-optical traps. The UK’s National Quantum Technologies Programme involves substantial government investment over the next five years. It is aimed at advancing the introduction of quantum technologies into the commercial marketplace – to greatly enhance the potential of the UK’s established and growing companies and industries and apply the practical benefits of quantum technologies to everyday lives. * Virtual link to the FEMTO-AAD evaluation rig – a live demonstration of the FEMTO-AAD facility. 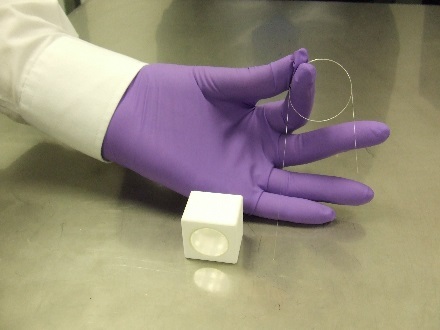 * Rubidium/Caesium filled hollow core fibre – key component for the quantum fibre clock (FEMTO-2ND / QFC). * Rubidium filled miniature cells – key component for the frequency stabilised laser packages, which themselves form a key component of many systems (FLAME). * Miniature non-metallic magneto optical traps – key component for cold atom experimentation and sensor development (gMOT/ColdCell). TMD is currently partnering with Kelvin Nanotechnology, the University of Strathclyde and the University of Glasgow to develop small, self-contained magneto optical traps (ColdCell and gMOT). The company is also working with Optocap and Fraunhofer UK on small frequency stabilised laser systems (FLAME).